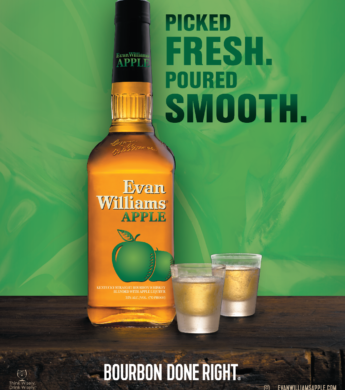 Evan Williams Bourbon today launched Evan Williams Apple, the newest addition to the fast-growing Evan Williams Flavors portfolio. The world’s second largest-selling Bourbon marries with the crisp taste of green apples for a delicious taste experience. A natural fit for the Evan Williams Flavors lineup, apple has seen heightened success across the brown spirits category as the flavor surpasses honey in popularity according to IWSR. As the flavored whiskey category has continued to expand, both established flavors, like honey, and newer entrants, like Apple, are propelling the segment to nearly 10 million nine-liter cases, showing that flavored whiskeys are still a key growth opportunity. The addition of Evan Williams Apple rounds out the flavor offerings within the Evan Williams flavors franchise, providing retailers an opportunity to build on the franchise success, as evidenced by Evan Williams Honey, which grew at seven percent over the last 12 months. To view or download more images from this release, click here.